No spam, no junk, no list trading. 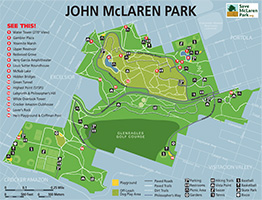 Just news and events for McLaren Park. What is Save McLaren Park? McLaren Park contains some of the last wild spaces in the city. In 2010, a disc golf course was slated for some of the park's most sensitive areas. In response, neighbors and friends came together to create Save McLaren Park (SMP). SMP advocates for the park, its environ-ment and facilities, and looks for new and fun ways to engage the McLaren Park comunity. We organize nature walks, picnics, and promote other activities in our natural areas such as work parties and trail building events. With the groundswell of new enthusiasm for this well-loved but long-neglected park, McLaren's future is brighter than ever. Created by SMP's Tom Scott. Available as 8.5 x 11 sheet. Thanks to everyone showing up at Saturday's Recreation and Parks Department (RPD) Trails meeting. A lot of good ideas were shared and a strong voice was heard to keep McLaren Park wild. RPD promises to post their most recent proposed trail envisioning map online soon and when they do we will pass the word. However, the commercial horse issue was not part of RPD's planned discussion. Instead we were encouraged to fill out the RPD opinion form (click on the link, then the Feedback tab) on their website. Many neighbors brought up the horse issues anyway. 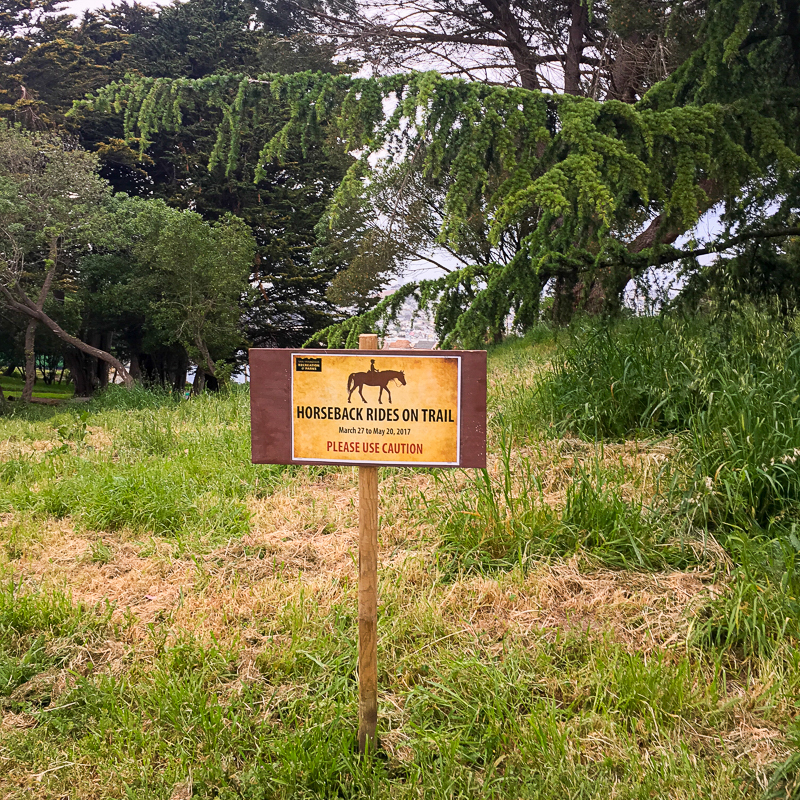 As you may have seen, pack horses are now riding the trails of McLaren Park. 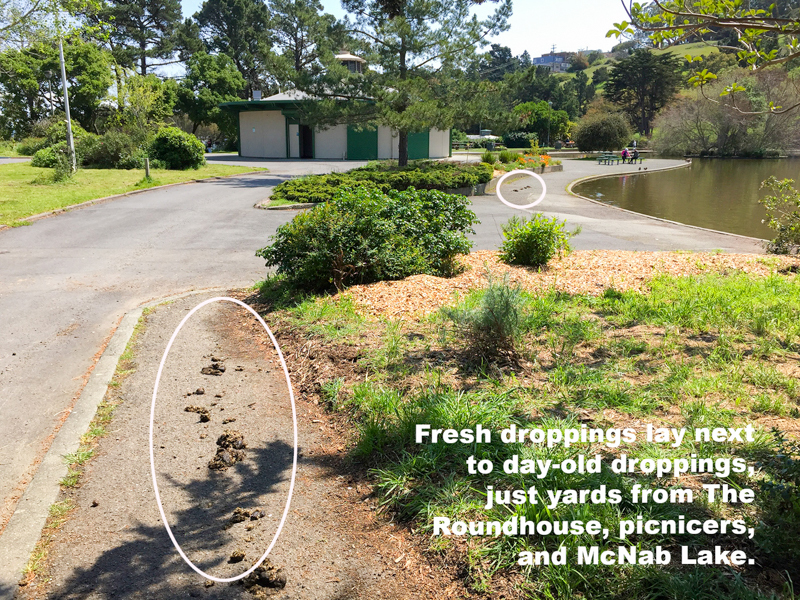 SFRPD is bringing a horseback riding concession to McLaren Park and Golden Gate park for a two month trial period which began Monday April 3rd. If the trial is deemed successful, it would lead to a permanent horse concession that would bring dozens of commercial horse trips to McLaren’s trails every week of the year. This decision was made without any public meetings or community input. Slideshow: Click on picture to enlarge. Move the cursor out of the window. SFRPD put up signs announcing horses were coming in early April. 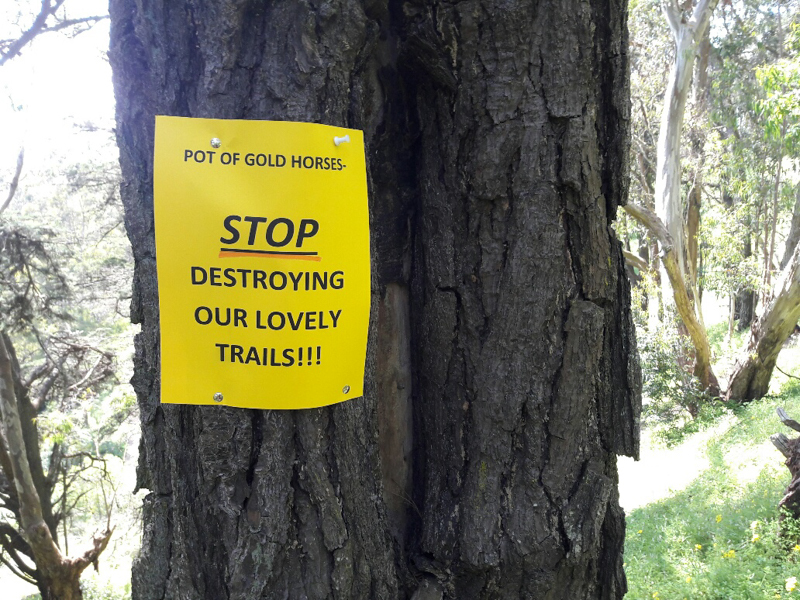 Damage began within days of horses using the trails. Winter rains create perfect conditions for severe mud damage. 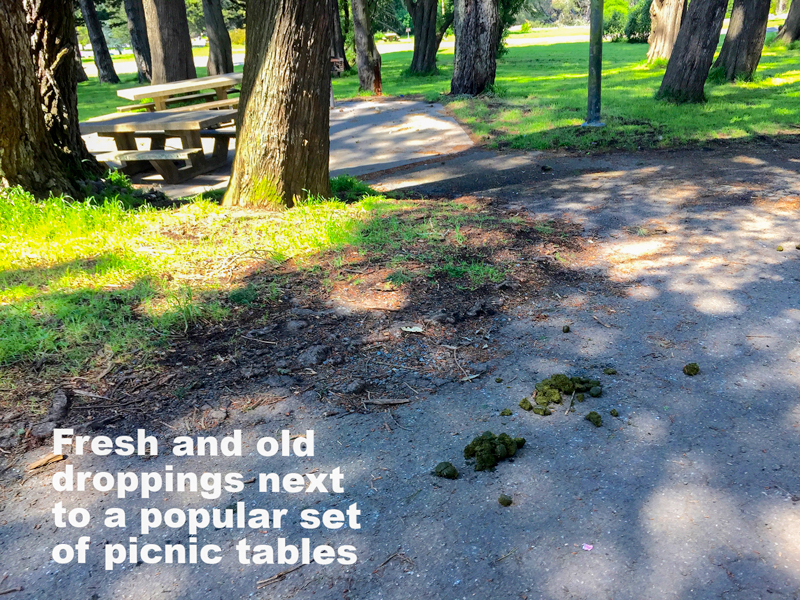 ...including heavily trafficked picnic areas. Manure is all over the park. Park lovers are sending their own messages. What is the future for McLaren's beloved trails? The plan has support from some community members who see horses as a fun way to get outdoors. 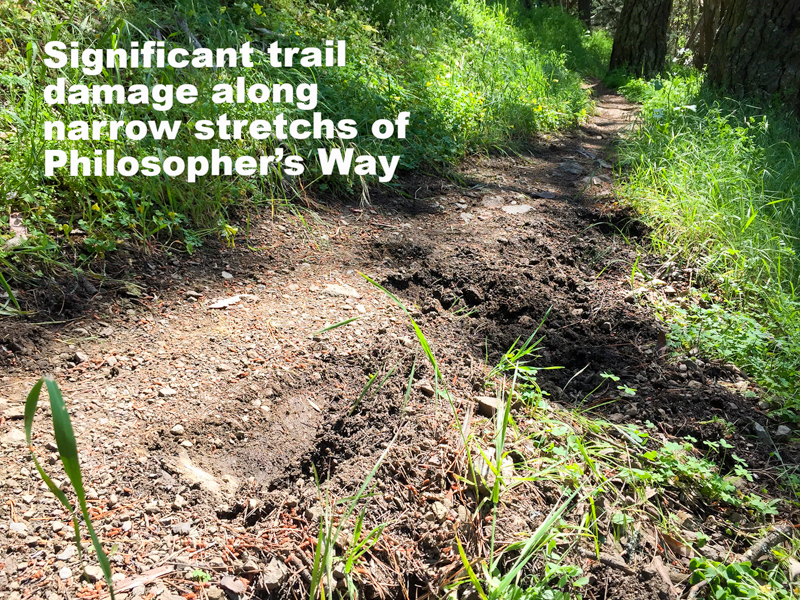 It is opposed by many other community members who are concerned about trail degradation, high potential for conflicts, animal welfare and excessive horse manure on the trails. 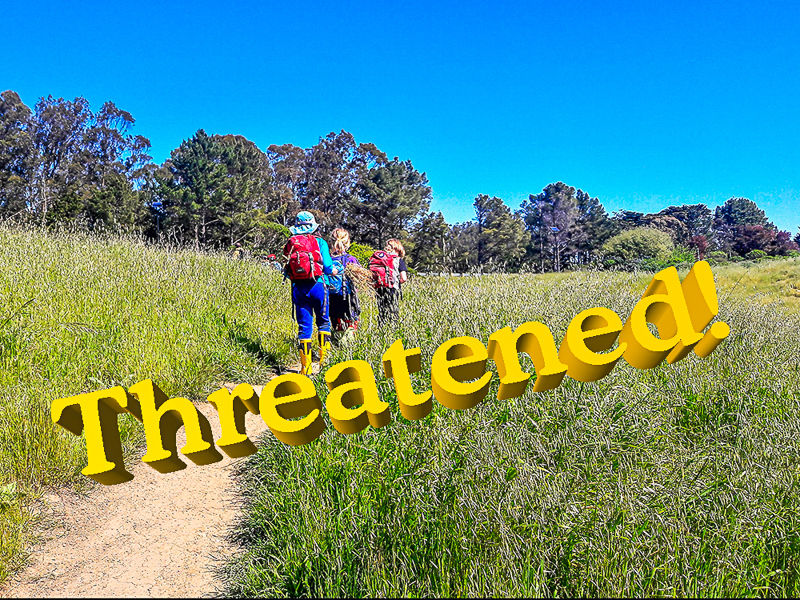 This issue has generated heated debates between friends and neighbors in the McLaren Park community. Erosion: A well trodden horse route can riddle the soil with deep indentations and turn trails into a dusty, sandy mess in the dry season and muddy puddles and rivulets in the wet season. All these changes make these trails difficult and unpleasant to walk or run on. After just two weeks of the trial, this is already happening. With three daily outings using up to 10 horses each time, it won't take long for the destruction to become permanent. 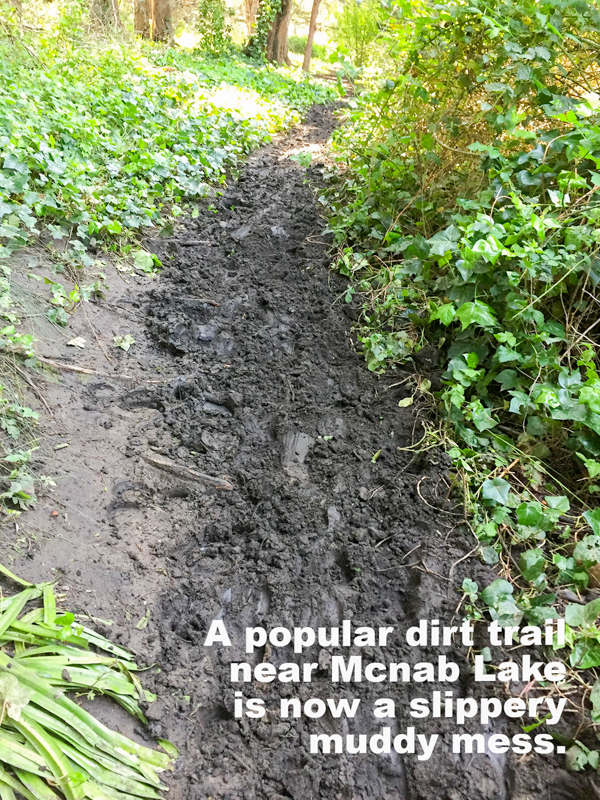 Conflicts between horses and other trail users: McLaren’s narrow trails are popular with all types of people: families, people walking their dogs, older hikers, and nature and educational groups. Conflicts between horses and these users doesn't happen often but when it does, the consequences can be severe. 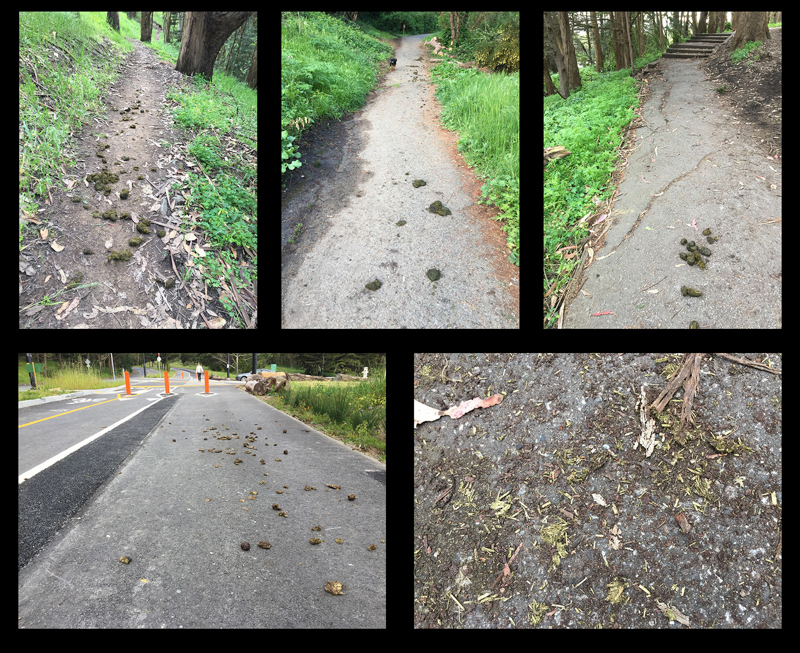 Horse manure on the trails: Two weeks into the trial horse manure is already being left for many days on pathways throughout the park despite RPD’s promise to police the trails after every ride. Animal welfare: The horses' living quarters are cramped to say the least. Ten or more horses are sharing a small paddock that once housed only four horses for the SPFD's mounted patrol. There is no room in the park for them to graze, and they are being forced to share narrow trails, which can be as uncomfortable for them as it is for other park users. If you have concerns about the horse plan or if you are concerned about the lack of public process for this significant change in park usage, please contact the city and park officials listed below and let them know. If you make only one phone call, make it to Sarah He, who is tracking feedback from the community. Voice your opinion on RPD’s online Feedback form mentioned above. You can find it here (click on the Feedback tab on the lower half of the page). Write a short letter to the RPD Commission and cc all the persons below. Contact information follows. It's Spring, and new Coyote pups will be arriving over the next few months, possibly including McLaren Park. That means its more important than ever that everyone be aware of their presence and act appropriately. Coyotes, humans and dogs can all coexist if we follow some simple rules:, listed below. City coyotes are generally not a threat to humans. Timid by nature, they have adapted to the urban environment and are able to find plenty of food. Many organizations have formed to help humans, dogs and coyotes get along. 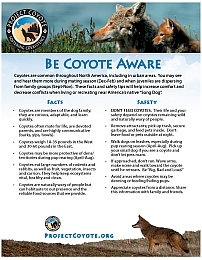 CoyoteCoexistence.com offers info and more on coyotes living around humans. 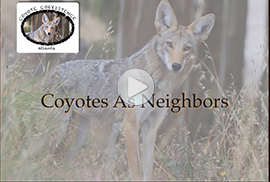 Click on the image at left to watch their acclaimed video, Coyotes As Neighbors.